May 14, 2007 – San Francisco, CA – PipeLineNews.org – Mazen Mokhtar a New Jersey Muslim born in Egypt was arrested on April 24 for tax fraud. Despite long being suspected of aiding al-Qaeda fundraising activities, he was released after questioning by U.S. Magistrate Judge Esther Salas in Newark after posting a $100,000 bond. Ms. Salas spent 9 years as a federal public defender and was appointed to the position of magistrate in November of 2006. Mokhtar has also served as the imam of Al Huda Islamic Center and is a frequent speaker at a Young Muslim camps run by the Islamic Circle of North America [ICNA] and the Muslim American Society [MAS], the American branch of the Muslim Brotherhood. In 2006 Mokhtar spoke in PA at a camp together with Shamsi Ali the Imam of the 96th Street Mosque in New York who is currently on the advisory board of the planned Khalil Gibran school slated to open in September. Mokhtar is charged with failing to file business tax forms for his computer company “Mindcraft” and making false statements on his personal income taxes. He has been under surveillance as a possible terrorist, working with others to raise funds for al-Qaeda. In September of 2004 his then lawyer, Yasser Helal admitted that Mokhtar’s North Brunswick, New Jersey residence had been raided by Homeland Security agents who seized computer files and other records. The principal in the terror funding case is a British citizen, Babar Ahmad who created a website – http://www.azzam.com – in 1996 which was used to funnel money to al-Qaeda’s operations in Afghanistan, Bosnia and Chechnya. Mokhtar’s alleged place in this terror conspiracy was in creating and maintaining mirror sites – including http://www.minna.com, which was is cited by authorities in the Ahmad case – which served to function in the place of azzam.com which was shut down post 9/11. The U.S. has been trying to extradite Ahmad since his arrest and has gained friends in high places including a participant in the U.N’s Oil For Food scandal, George Galloway, also a member of the British parliament. 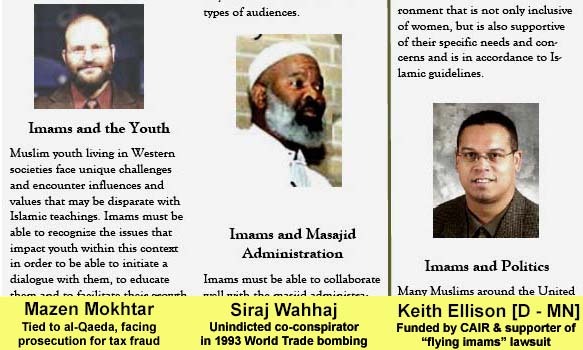 Mokhtar is deeply connected to the Islamist power structure in the United States, in 2006 he attended the North American Imams Federation [NAIF] annual conference in Minneapolis along with people such as Siraj Wahhaj, an unindicted co-conspirator in the first World Trade Center bombing and Keith Ellison [a former disciple of Louis Farrakhan] and the nation’s first Muslim congressman. It was at the conclusion of this three-day affair that the “flying imams” incident took place, which featured among others Omar Shahin, president of the NAIF [imam at an al-Qaeda connected Arizona mosque – the Islamic Center of Tucson] being removed from an airliner after acting suspiciously like terrorists while boarding the flight. The Council on American Islamic Relations is funding a discrimination lawsuit brought by the imams, designed to scuttle current airport security procedures and stop citizens from reporting suspicious activity they might observe at U.S. airports. This entry was posted on 13 May, 2007 at 3:05 pm and is filed under Arrests, Muslims in The USA. You can subscribe via RSS 2.0 feed to this post's comments. You can comment below, or link to this permanent URL from your own site. I am waiting for a CAIR press release claiming innocence because they do not follow US law and if allah had ordered it he would have paid the taxes. Don’t mess with the taxman-the only government types seemingly willing to take on Islamania. Lol I had never thought of the IRS as willing to tax the devil but I have to admit you might be onto something.